Manufacturers constantly battle what is called NVH, noise vibration and harshness. Ford has now developed a new tool to combat NVH in one of its oldest products, the F-150. The driveline of any vehicle is one of the noisiest parts engineers hope to quiet, and worse, any noise usually comes with vibration, which the driver feels as a low quality indicator. This is where Ford has applied its new technology. Intermeshing gears need to line up perfectly. 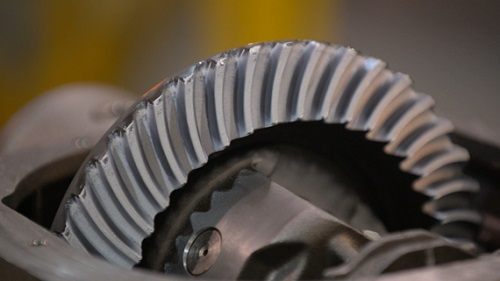 However, they are made separately, so the only way to inspect them is against a “pattern” gear that is used to define the perfect tolerances required for the gear set to work just right. For generations dye has been used to mark how the gears touch to ensure they are meshing perfectly. This is a time consuming process with a human element which can lead to variation and slows the inspection process. To eliminate the human element Ford looked to its suppliers, Automated Vision, and ATM Automation in Wisconsin. Working together the three partners developed a method of using multiple 2 dimensional images into a single 3-dimensional image that shows how the marking dye looks after the test. The new automated system can then make an analysis to determine a pass-fail standard for the gear set. Called a photogrammetric pattern reader (PPR), the machine speeds up the inspection process, while at the same time making it more exact. Incredibly, the machine takes 9,000 pictures of every single gear tooth as it rotates in an inspection rig. The software then melds these images into a 3D model of the part and it is compared to the test standard to ensure it meets the proper specifications. By using new technology on familiar parts Ford can make an F-150 truck that has less noise vibration and harshness and do so faster, and at a lower cost.